Manufactured by Intersound Inc.: An American Company. 11810 Wills Rd.. Warning: World rights reserved. Unauthorized duplication is a violation of applicable laws. NOTE***June 12, 2004: Although this cd is no longer available, except in rare circumstances on places such as Ebay, there is an alternative. Terry Salomonson of Audio Classics Archives has restored a large number of Lone Ranger radio shows AND he also has several different cds of the music used on the Lone Ranger. Terry has a web site for various radio shows and you need to first click on Programs on CD's and then scroll down to the Lone Ranger page, click on it and scroll down. 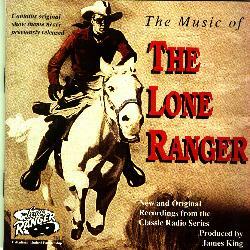 The first cds that you can order are the Lone Ranger music cds. Here's Terry's web site: "Audio Classic Archives"